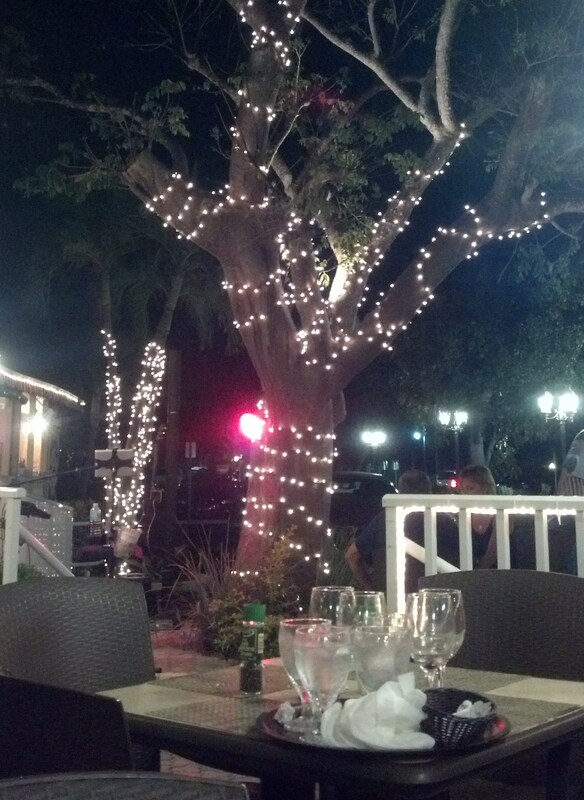 Far from the best food on Marco Island, the Bar and Bistro at Marek’s does deliver a nice atmosphere, especially if you can sit outside. The veranda is lovely, as is the terrace, and the live music featured on Tuesday and Friday evenings is perfect. Service was cordial, but inconsistent at best. The bartender was very pleasant but had no information about what bottled wines were dry versus sweet, for example. Thankfully, Penny, one of the owners, I think, loves wine and could help. Several menu offerings looked enticing. My husband chose the Asian Crispy Shredded Beef. Portions are very European, which is fine with us. But he found the taste just “okay,” nothing special. (He wished he’d ordered something else.) 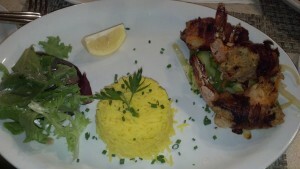 I had the Crab Stuffed Jumbo Shrimps. The bacon was crisped nicely, and the stuffing on these three beautiful shrimp wasn’t overly breaded. That said, the overall taste was not special. For the price, the value was good. Both entrees came with rice and stir-fried vegetables, were nothing to write home about, but the little side salad was nice. My husband wanted a cappuccino with dessert, but the machine was giving them trouble. We did share a slice of Key Lime Pie, which was zesty and pleasantly not overly sweet. This entry was posted in Martin on Marco, The Gripes of Cath. Bookmark the permalink.